The virtual extinction of the American chestnut across its range is like the story of the sack and burning of Troy. A few old timers can still remember when it was the dominant canopy tree both sides of the Appalachian mountain chain, although even then it was in retreat. In a few decades from 1904, entire regiments of trees were killed by a blight, and just a few old soldiers survived underground to sprout like ghosts in spring. There is an example in a friend’s yard. Long before we were born, it was probably a giant over one hundred feet tall with broad spreading limbs providing shade over his family home. But when it cankered after being attacked by blight its ring of cambium died and the old fellow rotted. Only its roots survived, and they are wearing out. For years it has struggled to grow shoots and branches, and last year managed to reach 20 feet and produce flowers for green burrs in fall, but it cankered again and was cut down to knee height. The cycle is repeated over and over, but each time the root system is less able to regenerate because there is insufficient nourishment from leaves. A Virginia forester who loves chestnuts told me that cankers can be stopped by rubbing them with dirt, because it contains antibiotics. 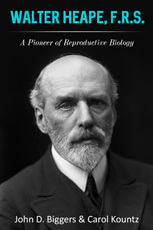 But a remedy that depends on our helping hands will never work across a forest, and is impractical when a tree grows up. There were still three or four billion American chestnuts in Longfellow’s time. A specimen he depicted in a poem grew in Cambridge MA until 1876 when it was cut down and some of the timber rescued to make a chair for his 72nd birthday. The chestnut has been called “the perfect tree” because it can produce a huge harvest of nutritious nuts and wonderful timber that won’t rot, and it is ornamental. The strong arms of the hard-working blacksmith are like the bows of the productive tree, and his virtuous life like the generosity of the forest giant. The loss was said to bring tears to the eyes of old-timers who treasured and depended on chestnuts, but have they gone forever? As an iconic tree, they still have friends and admirers today. 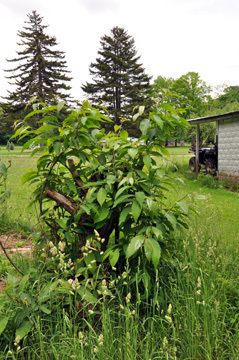 Researchers have been laboring to create a transgenic chestnut and hybrids that are blight resistant from backcrossing and intercrossing to incorporate genes that were evolved by the Chinese chestnut over eons for protection where the blight was endemic. 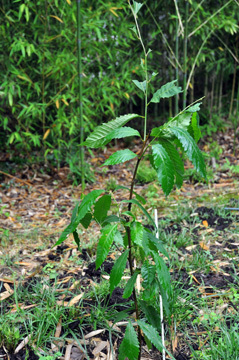 The latest generation of Restoration Chestnut from the American Chestnut Foundation is nearly 95% American and groves of them are being planted in Virginia and other eastern states. I care for one I planted in my yard last year from seed. Will it survive? Only time will tell. But blight is not the only threat—a marauding deer munched its crown last week. This entry was posted in Environment, Memoir and tagged American chestnut tree, Blacksmith, blight, Henry Wadsworth Longfellow. Bookmark the permalink.